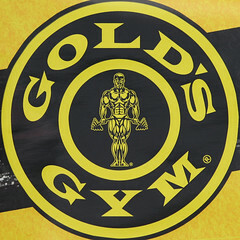 I’m a member of my friendly, local Gold’s Gym. I even say it in my “about me” authors profile. I have a gym crush on my Gold’s, and it’s the cheapest membership I can find in the locations I need my gym to be and I have the best personal trainer in all the land. But ya’ll, Golds is taking a turn for the seriously nasty, as they’re cutting their free towel service. Now, I realize we’re in a bad economy, and I realize that washing a bajillion loads of towels isn’t cost effective for their bottom line, nor is it very environmentally friendly. But the alternative? The alternative is bad. Here is how I envision this working – I pop into the gym, and spot burly big men, sweating all over the weight machine, having nothing but paper towels to wipe it up with. You see where I’m going here? SWEAT, is nasty. Big burly man sweat? Even nastier. Paper towels? Very un-environmentally friendly, as people pull of yards of towels in one fail swoop. Here we have a sanitation, customer service, and environmentally conscious EPIC FAIL. I get that I can go to Target and buy some wash cloths and bring them to the gym with me. I will do that, in fact. I hope EVERYONE at Gold’s will do that. But not everyone will (looking at you big burly sweaty paper towel loving man) and we’ll be stuck with a nasty problem. Also, I pay good money for my membership, and towels were included when I signed up. I also pay for my laundry, stupid coin operated apartment complex machine, and so it’s now an added expense. Sigh. What’s next? Taking out the water fountains and forcing us to bring our own or buy bottled? This entry was posted in: Essential DC, Life in the Capital, The Daily Feed, WTF?! Thank you Katie!!!! I was SO upset when I went to the gym last week and there were no longer any sweat towels. So very epic for my workout. Especially since I hadn’t been warned at all, so I had to cut back the workout so as not to drench everything in sweat with nothing to wipe it up with. It was a waste of a workout. I’ve already bought cheap wash cloths to bring with me, but I also pay for my laundry which is another big pain. Also I’m more worried about those who won’t bother to bring anything to wipe up their sweat. Gross indeed. So glad they take my membership fees every month yet cut back on their services. I think you meant “fell swoop” but “fail swoop” kind of works here. Wouldn’t a smart alternative be to have to pay for a towel to use? Someone might want to suggest that to a manager the next time you’re there; they may love the idea. This does sound like a staph infection’s dream scenario (ie: incredibly gross). This is where I advocate for an even more affordable solution – work out at home. Pushups, situps, crunches, jumping jacks, stretches, even small weights can be done at home for cheap or free. For most good exercise, all you need is the floor and your own body weight. you know what else is at my home? my couch, my bed, my computer, my roommate’s cat, and all the other things that make working out at my home IMPOSSIBLY UNMOTIVATING. Yes working out at home may be cheaper, but if I did that I definitely wouldn’t work out as much. And I pay for my gym membership and all the perks that come with it, including towel service. Which is the main point of this, that they are taking away something that we pay for in our membership. Also its just not very good customer service, it feels like they don’t care about the quality of the gym but are just cutting corners on us where they can. While we continue to pay the same exact membership fees. Its not about finding cheap alternatives to the gym, its about them being cheap with their members. At the Van Ness location, rarely did I see members clean up after themselves even when towel service was free. Between that and the wall of funk that hits you when you walk in the door (HVAC system has failed for years but the tvs have been replaced 3 times since 2006) I canceled my membership. I’d love to see how the location would score on a health and safety review. The Capitol Hill location said they would be giving out a free towel to each person while supplies last. Unfortunately, they pulled the old towels before the new free towel was available and left paper towels on the floor in the mean time. I agree that Gold’s is a bargain, but they have not been maintaining their facilities up to par. I totally support the removal of towels. One person mentions the HVAC not working – do you realize that the excessive dust & lint created by these ‘free’ towels raise total havoc on the HVAC system? Go out to Target or Walmart and buy your own towels to use. For those complaining about having to do coin-operated laundry – seriously? What are 5 more small towels a week going to do to your laundry bill? Anyone consider all the reasons why these towels may have been removed other than the economy? I can think of many. I use their sweat towels daily, but can still understand the need to remove them. I have no idea how much more I’m paying than at Gold’s, but I don’t give a damn. The fact is, very few people will bring in their own, whether it’s better for the environment or not (and clearly, there’s no difference between Gold’s having the towels or us bringing the towels; it’s still a towel that throws off lint and needs to be washed. No idea where that argument came from). And with pandemic flu on the horizon, the gym will be a GREAT way to catch it. This is just ridiculous. Glad we’ve decided to build our own home gym; this gives the idea that much more impetus. I guess that’s what happens when you buy the cheapest membership. I used to belong to Gold’s and liked it a lot. Then my friend convinced me to try Washington Sports Clubs. They are the absolute CLEANEST and they have towels. My favorite Trainer is Hollie at DuPont Circle. She is awesome. I hope WSC doesnt stop towels. I don’t theink they will. And here I was upset because Sport & Health has combined their body wash and shampoo available in the showers into one strange “Hair and Body Wash”, and taken away the conditioner completely. I think that’s an inconvenience, but I guess it’s really nothing compared to no towel service. Research has shown that if an exercise facility is located within 5 km from a person’s home or work, they are more likely to adhere to an exercise habit. If a facility isn’t convenient to you, find one that is. Find a location that is close to where you work, located on the way to or from work, or close to your home. So start by finding a suitable facility that is close by to your home, work or where you spend most of your day.